Since 1965 the Detroit Auto Dealers Association (DADA) has hosted its annual auto show during the month of January at the Cobo Conference / Exhibition Center located along the city's downtown riverfront. Despite snow, ice, and frigid temperatures hundreds of thousands of people each year attend the North American International Auto Show (NAIAS) to see what is new in amenities, designs, and technology from the automotive industry. 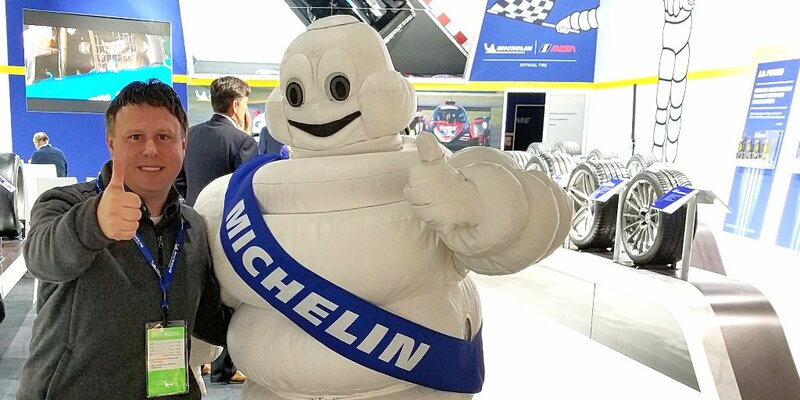 The glitz and glamor of the auto show has brightened up grey dreary winter days for generations of Metro Detroiters and provided them an exciting event to start off the new year. Soon though there will be some changes to this iconic event that are aimed to make Detroit's auto show even more appealing to attend and take advantage of the reinvigoration of the city's downtown. 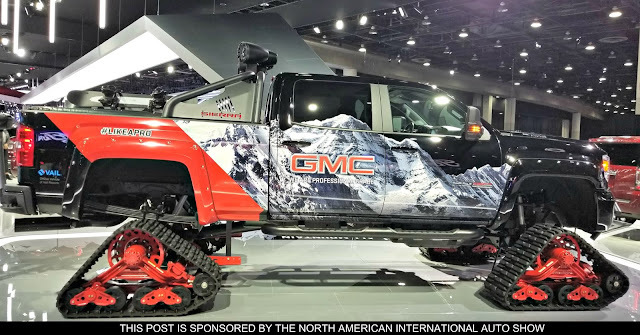 Beginning in 2020 the idea of using snowmobile treads like on the GMC Sierra Pickup Truck above or notion of wearing a heavy winter coat won't even come to mind when considering a trek to the North American International Auto Show. Detroit's auto show is saying good bye to cold weather and moving to the summer months! For 2020 the event will now take place from June 9 through the 20th. “Detroit now has the opportunity to showcase our scenic riverfront and revitalized downtown during our beautiful summer months as well as creatively use the exterior of Cobo to launch new products that will transform the city into an exciting auto-centric environment,” touted Larry Alexander, president and CEO of the Detroit Metro Convention & Visitors Bureau. 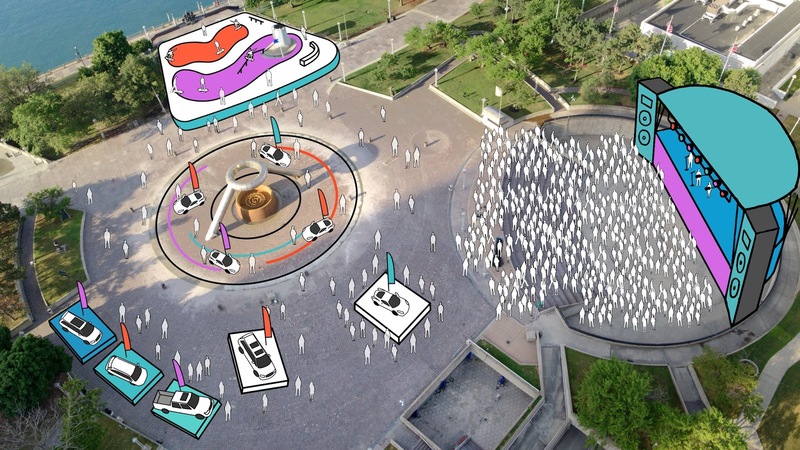 "It’s envisioned that auto show activities and exhibits will be expanded beyond the convention center to locations throughout downtown Detroit, including at some of the city’s jewels such as Hart Plaza, Detroit RiverWalk, Campus Martius, Woodward Avenue and Grand Circus Park. 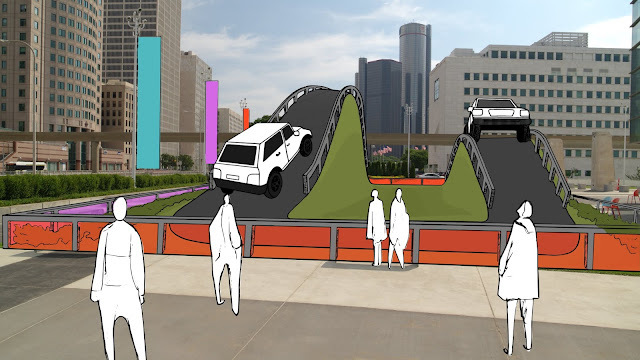 The event might even extend beyond the downtown area to historic automotive locations or state parks such as Belle Isle." 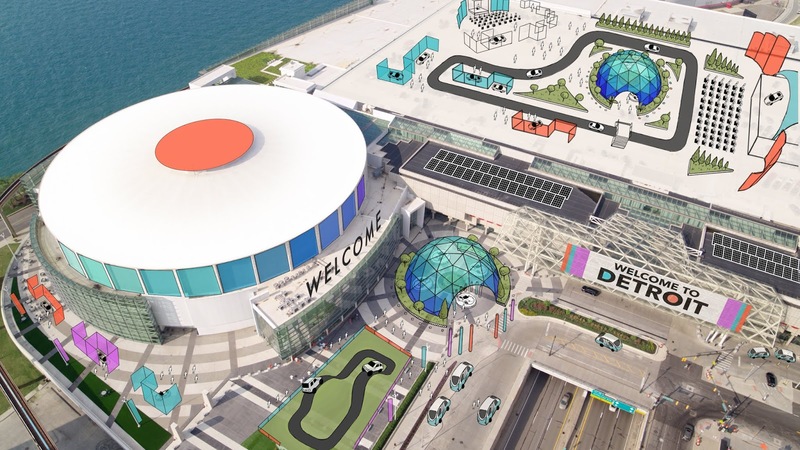 The DADA is hoping that moving the dates of its auto show will create a more dynamic environment which allows for more cross-marketing of venues and events throughout the City of Detroit. With winter weather no longer constraining the event to within its traditional indoor floor space to goal is to attract not just journalists and industry executives from not just across the country and around the world but tourists as well who want to partake in a festival like atmosphere. Organizers want to create a "must be there" vibe similar to the annual SXSW Festival in Austin, Texas and CES event in Las Vegas that provide experiences attendees don't want to miss out on participating in. Features being planned for the revamped NAIAS that will take advantage of being able expand outdoors in the warmer summer weather include staging more dynamic vehicle debuts, offering to actually ride or drive new car, truck and SUV models before the vehicles have been released to dealership, demonstrate new technology in action such as autonomous/automated driving, and incorporating aspects of extreme sports and auto racing into Detroit's auto show. Concerts and other entertaining activities will be mixed with the city's vibrant food scene to notch up the event's fun factor to another level. The reinventing NAIAS for 2020 and beyond will mesh together engineering, mobility and technology with dining, fashion, music, pop culture and sports making the Motor City the place to be. “There is the potential with moving the dates that the North American International Auto Show takes place to create a month long automotive themed celebration in Detroit with the auto show sandwiched between the Detroit Grand Prix at the beginning and the city's nationally-celebrated fireworks on the river at the end which would be unmatched festive experience," noted Rod Alberts, Executive Director of the Detroit Automobile Dealers Association. 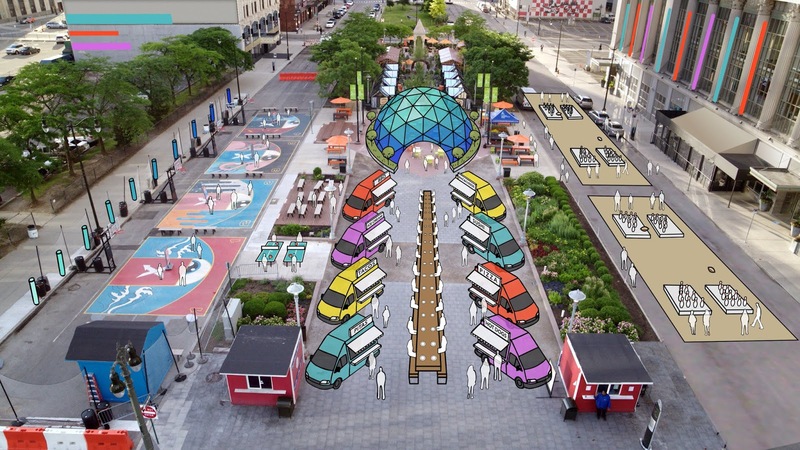 "Changes in 2020 and beyond to the auto show will ensure that Detroit continues into the future being a global stage for the automotive industry." I'm excited to see all the changes that are coming for Detroit's auto show. I have a lot of great memories attending NAIAS and am looking forward to making even more in future years. Of course the traditional show format is still going on in 2019. This year the North American International Auto Show is taking place from January 14 -27 at Cobo Center. Kia gave me a souvenir for the last winter time auto show in Detroit with an icicle themed "I survived NAIAS 2019" t-shirt they handed out while I was at this year's Media Preview Days. 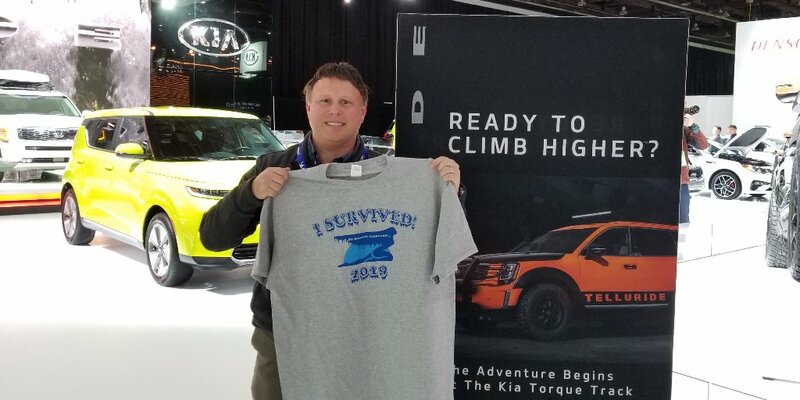 Highlights of the 2019 Detroit Auto Show for me included a MOPAR tricked out concept car that is a modernized version of the classic 1968 Dodge Super Charger, a Chevrolet virtual reality experience that takes you for a spin in some of their cars, and the chance to go for a ride in the brand new Kia Telluride SUV around track that replicates outdoor off-roading inside the exhibit hall. I always enjoy checking out the race cars on display and there were a lot of impressive ones to see while there ranging from Alfa Romeo Formula One to Kia Red Bull World Rally cars. 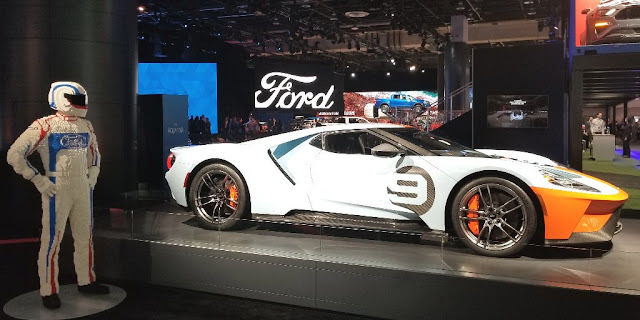 My favorite one to see though had to be the Ford GT Heritage which is based off of their '60s era GT40 car which won the 24 Hours of Le Mans endurance race four consecutive times from 1966 to 1969. Now that is one sweet ride! Want to go to the auto show for yourself? Enter to win one of ten pairs of tickets to 2019 North American International Auto Show by completing the form below. Plus one lucky winner will receive a $100 gift card along with their tickets. So who wants to go the Detroit's Auto Show?!! Contest rules: Entries must be completed by midnight January 16, 2019. No purchase necessary; contest open only to US residents 18 and older and subject to the laws of Michigan. Winners will be notified by email by January 17, 2018. Winners MUST pick up tickets in person at the North American International Auto Show, Cobo Center, at 1 Washington Blvd. , Detroit, MI 48226 between January 19, 2018, and January 27, 2019. Winners may be asked to provide identification to receive their prize. Prize value $30 per prize, not exchangeable for cash or other items. Grand prize value is $130. A total of 10 pairs of tickets will be awarded and a total of 1 grand prize will be awarded. For more information about the auto show, please go to naias.com. Thanks to Detroit Auto Dealers Association and A Girls Guide to Cars for hosting the NAIAS ticket giveaway and providing this Motor City gear head press credentials for the Detroit Auto Show media preview days. We used to go to the auto show every year. A few years of horrible weather broke the habit. Maybe I'll check it out again in the summer ;) Looks like a lot of planning has already been done. I have only been to the Detroit auto show once, in 2008, but it was a good time. I'm glad they are moving it to the summer. I've even heard about the Detroit Auto Show and I'm in Toronto. That's great that they'll be having it in the summer! We attend our car shows in our local area. It is always in the winter and always a fun thing to do! Sounds like a really interesting event. It would be cool to see all the new technology out there! I've never been to an auto show but this would be fun.